The other day while walking through the long hallways of the subway system at Penn Station, I paused for a moment to admire the tile art. Only briefly, of course, since I was in a rush along with my fellow 5.7 million travelers who ride the 22 interconnected subway routes every day. But, throughout NYC's underground transportation world, there are nearly 300 works of art. Three hundred! If you're up by 167th, you can enjoy the work of Carol Sun, whose brilliantly articulated stained glass panels depict "radiant outdoor urban life with the calm, simple pleasures that are experienced in the home and community." Or maybe you'll be enchanted at 34th Street by Eric Fischl's mosaics of a commuter who is "drawn into the bizarre and surprising world of the circus, meeting animals, clowns, acrobats and fire-breathers along his way to work." 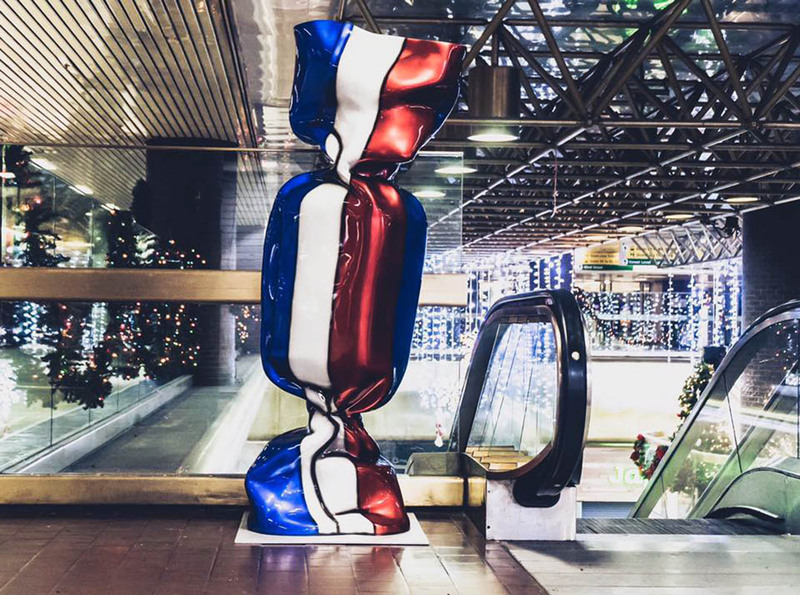 While the art may not be your intended destination, the MTA has curated a prolific collection to complement your commute. Before you go underground, check out the collection here. Are you more of a bus person? Well, Port Authority also has you covered. Amid the hustle and crazy bustle of the bus station, French sculptor Laurence Jenkell makes her US debut with her whimsical works from 'Crossroads of the World, ' Reminiscent of works by Jeff Koons, Jenkell's oversized fiberglass candy wrappers among other colorful, shiny works strike an unlikely but wholly welcomed pose against the backdrop of NYC's busiest bus gateway for 200,000 passengers every day. To learn more about the exhibit, click here. Few among us enjoy the NYC commute. But taking a moment to appreciate the art underground, well... that just might make your travels a more beautiful experience after all. 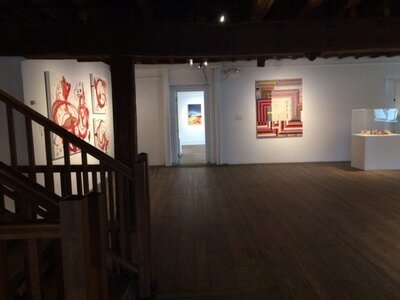 A full day in Nyack with nature, art and music. If you haven't visited Nyack, then put it on your list! You can spend a lovely, leisurely day infused with nature, art, music, food and even a little retail therapy if you so choose. Start the day early at Nyack Beach State Park. 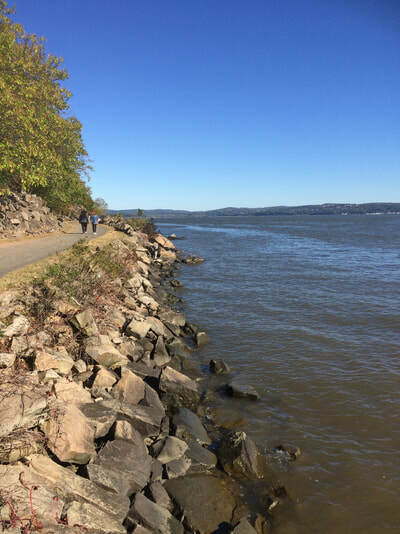 and pack a breakfast or light snacks as there are plenty of places along the trail to sit down and take in the scenery of cliffs, the Hudson's swift-moving current and the old and new Tappan Zee bridges. I plugged into my GPS 698 N Broadway Nyack which took me straight to the parking lot of the state park (and yes, there are bathroom facilities there as well). You also have the option to drive up to the Plateau (there is another parking up there) for a different view, but I preferred the riverside trail. Nothing beats the sounds of the waters lapping against the rocks. 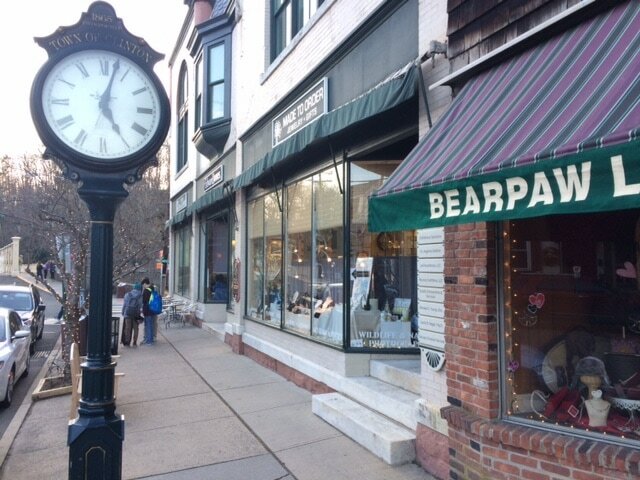 Just 2 miles from the park, head into historic downtown Nyack, where you will find beautiful antique stores, boutiques, bustling and cozy restaurants, and American realism. 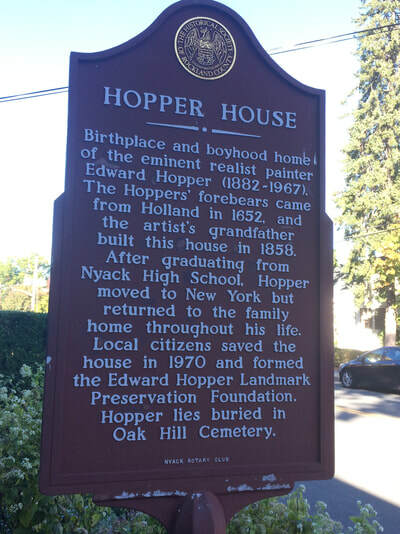 After all, this is the birthplace of Edward Hopper. Step right into the home Hopper inhabited before he moved to NYC at 28 years of age. Restored and on the National Register of Historic Places, the Edward Hopper House celebrates the legacy of the artist as well as emerging artists. Chances are you have worked up an appetite, and I highly recommend the Art Cafe. Art Cafe is an intimate, casual spot to enjoy drinks, plates of Israeli-inspired foods (the eggplant malawach was to die for and be sure to get the spicy shakshooka sauce on the side), local art and live music. You can check out their music and art events calendar online or follow them on their Facebook page at https://www.facebook.com/ArtCafeNyack. At the heart of every darling enclave is a beautiful public library and delightful independent bookshops. And Nyack delivers both with cultural and literary aplomb. Explore Nyack's rich history in the 138-year old, ivy-covered public library. 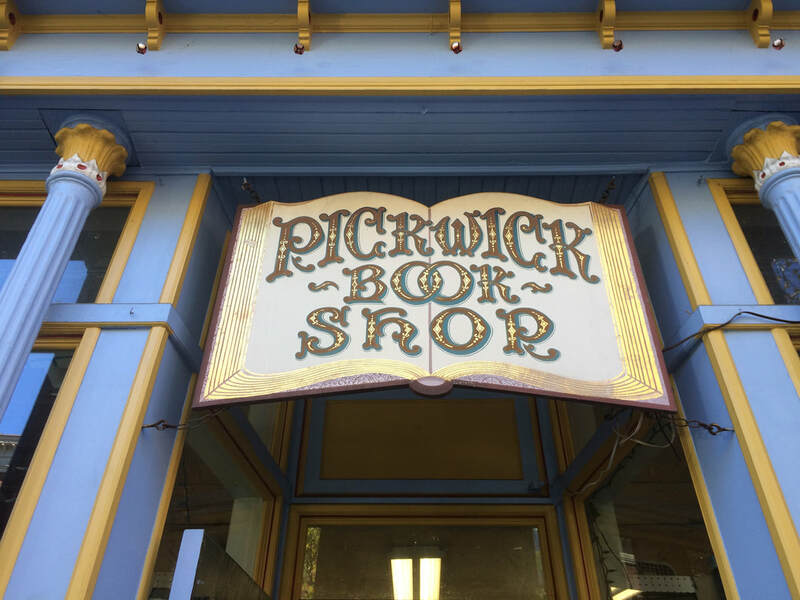 Get lost among the towering piles of books in Pickwick Bookshop, a bookworm's daydream that's been in the neighborhood for 72 years. And who wouldn't love a shop that proudly boasts the best selection of books about the Nyacks and Hudson Valley! 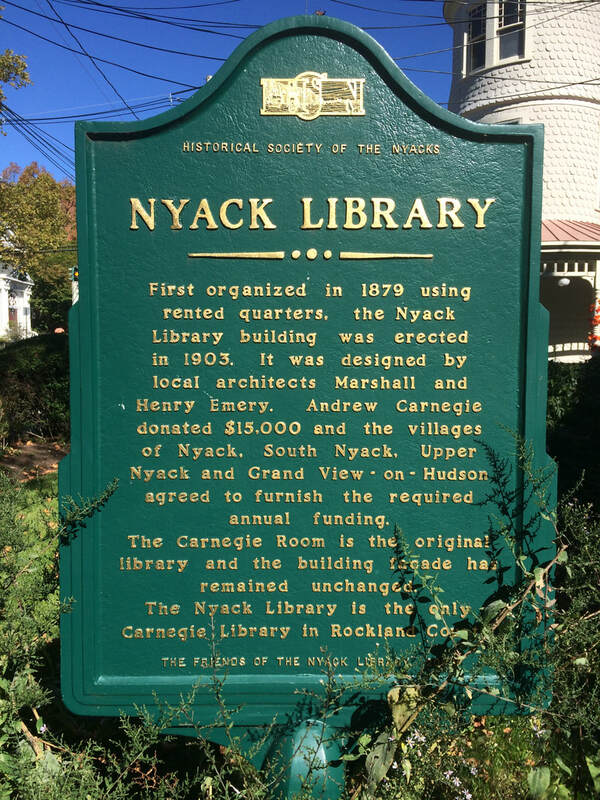 There's lots more happening in the nooks and crannies that make up this community, most of which seems available for your planning pleasure at Nyack News & Views: ​http://www.nyacknewsandviews.com. Enjoy the find! If you can text, you can play an instrument. When I was 8 years old, my elementary school brought in a vendor to showcase instruments. I chose the flute. My flute career took me from public school music classes to a private instructor, From there I studied at the Preparatory School at the New England Conservatory of Music, and eventually joined both the Massachusetts Youth Wind Ensemble and the Greater Boston Youth Symphony Orchestra (now the Boston Youth Symphony Orchestra). And while at NEC, I was in several chamber music groups. I played in college and even taught for a short stint after graduation. I was spending a lot of time reading music, learning how to read other people's cues, and engaging in a difficult, but rewarding experience with peers. I learned how to be an individual in a group and discovered at an early age why a group dynamic is so important. We looked at each other. We listened carefully to one another. We breathed together. We were in synch. And when we weren't in synch, we'd stop and discuss where we were falling apart and how to get back into the rhythm of each other's parts. When you function well together, you can make some pretty amazing music. I never left an ensemble session feeling empty or unaccomplished. If anything, I left knowing I had a lot more to practice and perfect, so that I could be more of a benefit to the group. Today, it seems when I see kids in groups, they're all heads down in their phones. I've seen my own kids text. They are quite fast. I've seen their friends all sitting together, heads down, all texting, their digits a blur with quippy responses to snapchats and instas and direct messages. Just imagine if they took all that time learning how to play an instrument with those uber-dextrous fingers of theirs! "You should talk, mom," I hear in my head. It's my son, staring at me as I text, just as guilty and guiltily as anyone else. Maybe this entry is as much of a promise to myself as it is a recommendation to others. I'm not saying that there aren't kids out there playing in bands, chamber groups or orchestras. And I'm not saying that those kids aren't texting in between sets of music (heck, they're probably taking selfies while playing, that's how good they are!). 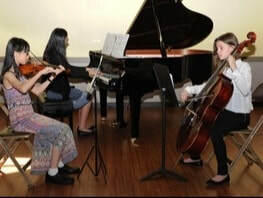 But in a world when teenagers seem to be spending less time together making eye contact or learning how to collaborate without technology to connect them, why not make a music ensemble their new place to hone those skills? After all, what makes the world go 'round? Music, of course. 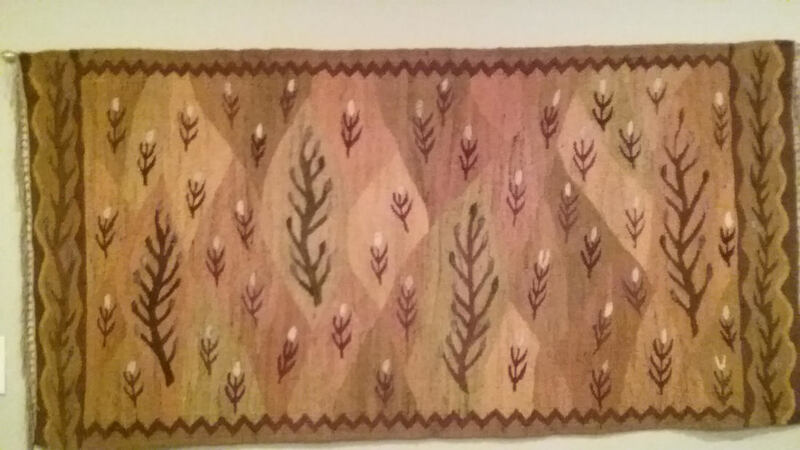 Every time I visited my grandparents' home in Stoughton, Massachusetts, I would stare at this wool wall hanging in their dining room. "I don't know how you don't see it!" I would exclaim, frustrated that it wasn't immediately obvious to others sitting at the table. "Clearly it's a man walking with his young child in the forest. See? The child on his tiptoes, trying to keep pace with his dad, who's in mid stride?" While others just saw abstract variations of browns and beiges, with organic lines representing flowering plants, I saw people's legs in movement, and imagined a whole story line to go with it. These two people were walking with a determined gait, maybe anxious to get home before it got dark. Of course, the artist who made this wall hanging probably didn't intend that at all. But it's what I saw, and it was -- and still is -- very real to me. Who remembers the Old Man of the Mountain, the granite rock formation in New Hampshire's White Mountains that also resembled the profile of a bearded man? Or how about Ebay's infamous and very expensive grilled cheese sandwich with toasted marks resembling the Virgin Mary? This is the phenomenon known as pareidolia, defined as "the tendency to perceive a specific, often meaningful image in a random or ambiguous visual pattern." The root of the word borrowed from both Greek and German, referring to reflection and apparition. One person might look at Georgia O'Keefe's paintings and see flowers, yet another may see reproductive organs, pushing us to question the artist's intent and what we are imagining into the visual object. When we insert our interpretation, changing what is there into what we perceive it to be, we can influence others to do the same. Or, we inspire others to imagine something entirely different. In a 2012 Scientific American article, the authors noted, "Our brain is wired to find meaning. Our aptitude to identify structure and order around us, combined with our superior talent for face detection, can lead to spectacular cases of pareidolia, with significant effects in society and in culture." I don't know if we can technically call it the opposite of pareidolia, but there are those who don't have any ability for face recognition at all. This is referred to as prosopagnosia (or face blindness), and it's a condition that world renowned artist Chuck Close suffers from, making his art and his artistic process all the more remarkable. He paints his eerily realistic portraiture from two-dimensional photographs, enabling him to commit to memory the faces of people close to him. "I am as interested in the artificial as the real," Close explains. His fascinating interview can be enjoyed below. So now take your newfound knowledge of pareidolia and prosopagnosia, and appreciate and reinterpret the world around you. You will be amazed and inspired by what you discover. Our Top Picks for Live Summer Music! EVER SO TECHNICALLY, it's still spring. But with the wave of heat blanketing our area for a couple of days, it's certainly putting us in a really good mood in anticipation of the summer solstice... and for researching the best events to listen live to classical and jazz music. Here's our go-to list for free or affordable options both indoors and outdoors. Got a place you'd like to add to our list? Shoot us a recommendation at info@westerhoffschool.com and we'll add it with a thank you! 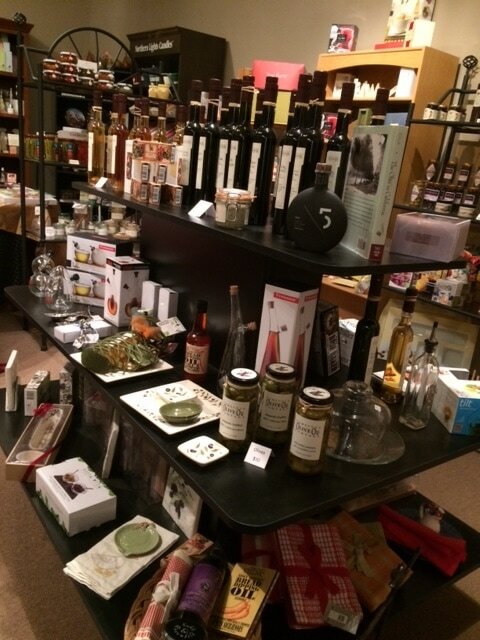 Princeton Festival Through June 25. "The Princeton Festival is New Jersey’s premier performing arts festival, featuring nationally-renowned professional artists in more than 10 different types of performances plus a dozen free lectures and special events each June. We produce fully-staged musical theater and opera productions and present a varying offering of jazz, chamber music, a cappella and symphonic concerts; piano, organ, choral and dance recitals; world music, a piano competition, a conducting master class, lectures, educational programs … and more!" Some events are free, some are not. New Jersey Symphony Orchestra Family Concerts! FREE! "Pack your gear and come along on a 'Road Trip Across the USA,' NJSO-style. Travel from our New Jersey home through the heartland with John Williams’ moving score to Lincoln, to the Wild West and Copland’s iconic Rodeo, all the way to the Magic Kingdom with favorite music from Beauty and the Beast. It’s fun for the whole family on this memorable musical trip!" FREE concert dates include June 23 (Clark), June 27 (Overpeck County Park), June 29 (Hoboken), June 30 (Branch Brook in Newark), July 1 (West Windsor), July 2 (Red Bank), There is one ticketed event on June 25 (Madison) with reservations available here. Mercer County Jazz Festival July 8 from noon to 8pm in West Windsor, NJ. "Music Stage, Crafters, Food, Kid's Activities, Lake & Forest and a Beer Garden. Vendors of exotic and regional NJ food (NJ food can be exotic, huh?) ~ Craftspeople! Six great bands including Joey Defrancesco & The People as the featured closing act! Featuring a stage for music, Kid's Activities, the woods, and JAZZ! Rain or Shine!" $10 admission. Scores: New Orchestra Works (Princeton, NJ) On Saturday, July 15th at 8pm at the Richardson Auditorium in Princeton, NJ. Tickets are $15 each. "JoAnn Falletta conducts the NJSO premieres of dynamic works by the composers of the NJSO Edward T. Cone Composition Institute, a multi-faceted program that promotes new music and emerging composers. The Institute composers will briefly share the inspiration behind their pieces in an evening that will show the vibrant future of orchestral music." Tickets available here. The Baroque Orchestra of New Jersey Summer Festival The BONJ Summer season kicks off on August 6 at 3pm with La Boheme at Dolan Hall, The Annunciation Center, The College of Saint Elizabeth, 2 Convent Road in Morristown. Tickets $5/student, $30/senior, $40/adult. On August 12, catch the Summer Cabaret at Grace Church, Madison, New Jersey at 7:30 PM. Tickets to Summer Cabaret are $25 each. The festival continues August 12 and August 13 with chamber music, and concludes with Summer Breezes Orchestra on August 20. More details and ticket information is here. JazzFest (Montclair, NJ) FREE! On August 12 from noon to nine, rain or shine. 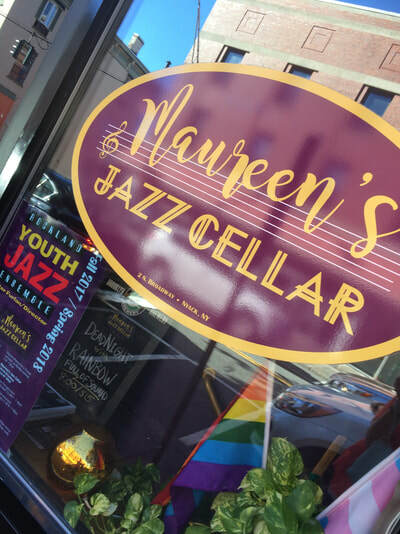 "The annual Montclair Jazz Festival is the biggest single one-day event in Montclair! Come on out and invite your neighbors, friends and family to celebrate the incredible, original American cultural tradition - JAZZ! No tickets required! Bring folding chairs or a picnic blanket and enjoy a full day of live music!" Jersey Shore Jazz & Blues Festival (Long Branch) FREE! August 26 from 1pm to 9:30pm on The Great Lawn (on the Boardwalk) at Cooper Avenue in Long Branch, NJ. "Six great bands including Popa Chubby as the featured closing act! Featuring a stage for music, Kid's Activities, the Beach, and the Blues! Rain or Shine!" Artists' muses for music are as varied and complex as the creators themselves. Sometimes a musician's muse is a mystery. Take for instance the repertoire of Beethoven's most romantic pieces and the many candidates whose lives and influence are as layered and complex as the notes on a page. Or perhaps these muses are powerful figments of an artist's imagination. Consider what Tchaikovsky meant when he famously wrote, "I sit down to the piano regularly at nine-o'clock in the morning and Mesdames les Muses have learned to be on time for that rendezvous." Of course, music itself can be the muse. In a New York Times article about Einstein, we learn that Mozart had a profound impact on the world's most famous genius who "was fascinated by Mozart and sensed an affinity between their creative processes, as well as their histories." Sometimes a muse is not in a personified form, but takes on the shape of something bigger than all of us. Like Nature. Did you immediately think of Vivaldi's "program music" that presents a musical narrative on the Four Seasons? Did the seasons of spring, summer, fall and winter serve as Vivaldi's muse, or was it the pastoral landscapes of the Baroque painter Marco Ricci that served to move Vivaldi's notes as if they were strokes on a canvas? Last month PBS Newshour explored the life and muses of a composer named Stephen Lias whose muses are our country's National Parks. He calls the album Encounters, and as you listen, you find yourself contemplating how the instrumentation of each composition reflects the intricacies and wonders of these treasured territories. Take a moment to contemplate your muse and how he/she/it shapes the art and music you create. The New York Times just posted an article about 2017 spring and summer art openings that are worthy of our attention. Westerhoff's 'Running Wild' group was already ahead of the curve with a trip in the works for March 30 to the Montclair Art Museum to see the critically-acclaimed Matisse & American Art exhibit. We're also really excited to check out the Robert Rauschenberg: Among Friends exhibit at the MoMA and the The Jazz Age: American Style in the 1920s at the Cooper Hewitt. But gas up the car, kids! There are so many more wonderful openings from sea to shining sea, and if you find yourself in any of the locations mentioned in the NYT article, why not throw in a little arts & culture into the mix. New Jersey is home to so many museum gems, tucked away in picturesque towns. 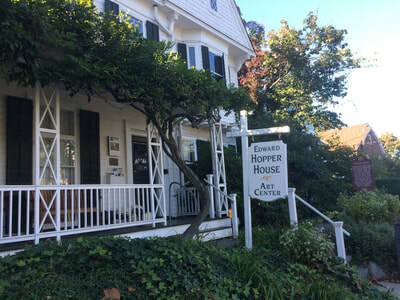 One such find was Hunterdon Art Museum in Clinton, New Jersey, just 45 minutes due west of Metuchen/Edison. Currently, the museum is exhibiting RED, featuring works by ten artists who use the color "not necessarily as a predominant color, but because it conjures up a specific emotion or plays a vital role in the work's narrative." 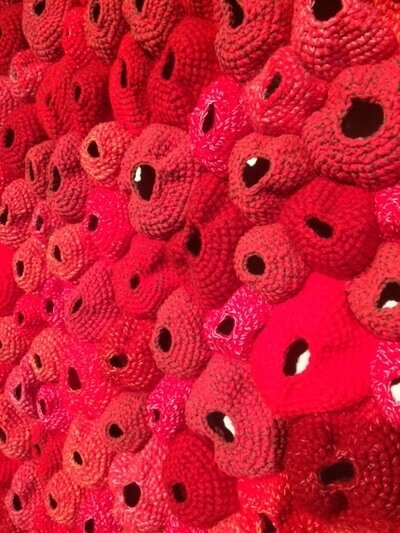 You are greeted to the exhibit by a stunning crocheted work reminiscent of a coral reef. The convex stitched orbs play with the shadows on the wall, adding to the three-dimensionality of this abstract textile art. 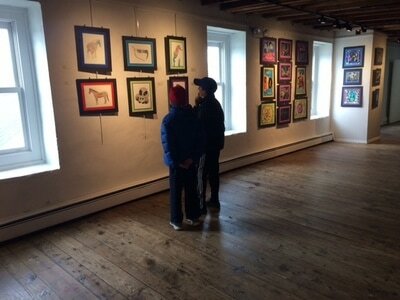 Also on view are ceramic "brickworks" of Adam Welch, landscapes of Wes Sherman, and an impressive and inspiring display of young artists' works on the third floor of the museum space (area schools have rotating exhibitions and the works of art are worthy of the space in which they temporarily call home). Also recommended on your visit to Clinton: The Red Mill Museum Village where you can take in 200 years of history in about an hour's time. 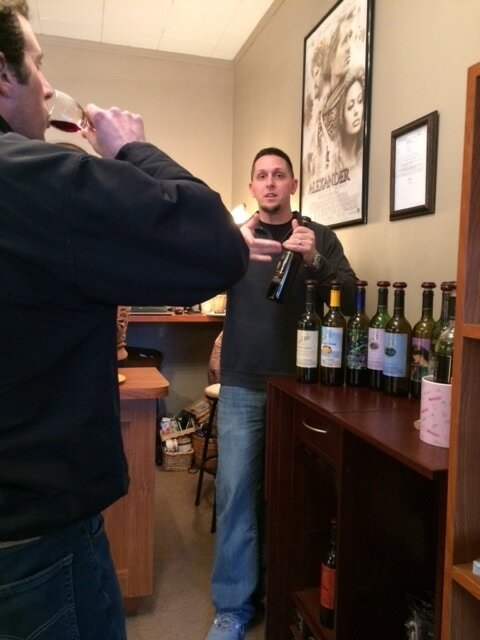 Stroll through the quaint downtown area for the shops, and go for a wine tasting at Balic Wines - surprise yourself with a taste of blueberry or mango varietals, or sample the more traditional dry whites or full-bodied reds that they also offer, all locally made. And do not miss out on a meal at an impeccably charming BYOB called The Clean Plate Kitchen (check out the rave review by The New York Times), especially on a lovely warm day when you can take in the view along the river overlooking the Red Mill and waterfall. So we're going full throttle on social media presence. In addition to our Facebook Page (please like us at http://www.facebook.com/westerhoffschool), we've got a Twitter Handle (@LearnMusicArt) and an Instagram Page (http://instagram.com/westerhoff_school). We even have a few items posted on Vimeo. But because we're also old school, we like to socialize in person, too. Stop by on Monday, February 13th from 4 to 5:15PM to make some Valentines with us ($5 per person includes materials, cider and cookies). Let us know you're coming at info@westerhoffschool.com. Our Spring Schedule Kicks Off This Weekend! 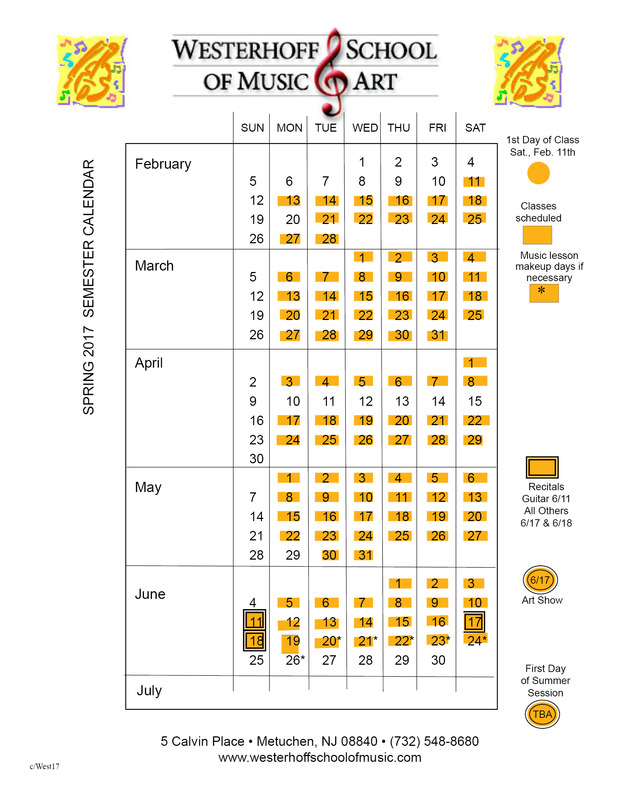 Be sure to check out our new SPRING SCHEDULE. Our music and art classes kick off February 11th with shows scheduled in mid June. Whether you are hoping to take up an instrument for the first time or continue with music lessons, our seasoned professionals are excited to develop our students skills in piano, violin, viola, cello, clarinet, saxophone, flute and classical, electric and acoustic guitar. And for those who want to develop visual arts skills, Mickey Waring is preparing her art studio for an array of classes for students as young as 3 through adult! Check out the ART OFFERINGS this session. We welcome all students from Metuchen, Woodbridge, Edison, Iselin, Rahway, & Plainfield and their surrounding areas. Want a tour of our facility? Email us at info@westerhoffschool.com to arrange one. Or inquire directly from our website. We look forward to SPRINGING FORWARD IN MUSIC AND ARTS EDUCATION with you! ﻿Did you know there's a photographer among us? Gary Westerhoff's name is on an art and music school building. But what many may not know is that he's an avid nature photographer and his works are simply stunning. Several of his photographs are exhibited on the second story wall of the school. We encourage you to check it out and be inspired by his perceptions and interpretations of landscapes and wildlife spanning the Americas on his website filled with an online gallery of his extraordinary photos. Gary Westerhoff is a licensed Professional Environmental Engineer and Professional Planner and a national expert on drinking water. Prior to retirement, he provided consulting services to major drinking water utilities throughout the United States and was CEO of a national environmental consulting and engineering firm. Over more than five decades he has developed a passion for outdoor adventures. This passion combines fly fishing for trout and salmon with landscape and wildlife nature photography across North America, Canada, Central America and South America. Many of Gary's wildlife images catch the individual characteristics and habits of the animals and their relationship with the environment in which they live. It's Westerhoff's blog event! We find things that inspire us. Then we share it with you. Welcoming all students from Metuchen, Woodbridge, Edison, Iselin, Rahway, Plainfield and surrounding areas.